It's September 1895 in New York City. Six years have passed since Tony Petrosino, a 14-year-old Italian immigrant, seized the opportunity to become a photographer. Now his sister Angelina is 14. She would like more education but, as with Tony and her two other brothers, Papá has insisted she work full-time. 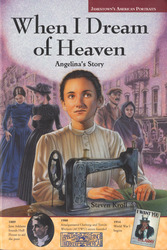 Always her mother's helper, "Gina" starts sewing garments at Sidowski's sweatshop. The work is hard, but when her friend Rosie joins her in the shop and they become friends with Louisa and Judy, the lure of freedom becomes impossible to resist. Wearing stylish clothes and going out to dance halls is not only fun, but a way of separating from their parents' Old World ways. How this conflict is resolved for Gina-and the part Clarissa Dale of the Jamestown Dales plays in it-makes for a story both poignant and dramatic.